Unleash complimentary reactions utilizing the subtraction of contradicting actions. To all whom it may concern be it known that I, Gaby de Wilde, artist, subject of the Dutch Queen, of Dutch nationality, a citizen of the independent monarchy of the Netherlands governed by members of the House of Orange Nassau, residence of Enkhuizen, in the Province of North-Holland the Kingdom of the Netherlands, have invented a method of making magnets interact unequally thus allowing for the construction of perpetual motion apparatus in the most general sense thereof I hereby declare ofwhich the following specification to be a full, clear, exact and accurate description of the invention, such as will enable others skilled in the art to which it appertains to use the same as from. On the side of our to be secondary magnet one already finds 2 poles. 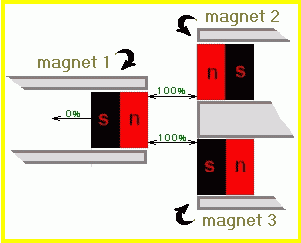 The "complex" path though the field in order to make the poles interact with each other(the magnet with it self) is found when the primary magnet is moved over the domain wall passing the side of the secondary magnet where said secondary magnet is then subjected to torque while the primary moves over the domain wall whereby allowing this torque to do work over distance it does create some drag onto said primary magnet but not in any conservative event as elaborated above and illustrated under "it cant be!". Apparently Newton (in having researched perpetual~motion) was just wrong in his observation and so where quite a few other people. Still his method is that what allowed for this publication to happen. 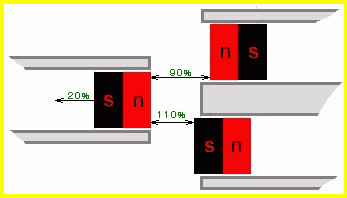 Physics has given to much credit where it wasn't due disabling to recognize the sum of attraction and repulsion can not do work from which on thus therefor and so~on does not cost work either as rest is infinitely efficient you shall not wear out such.